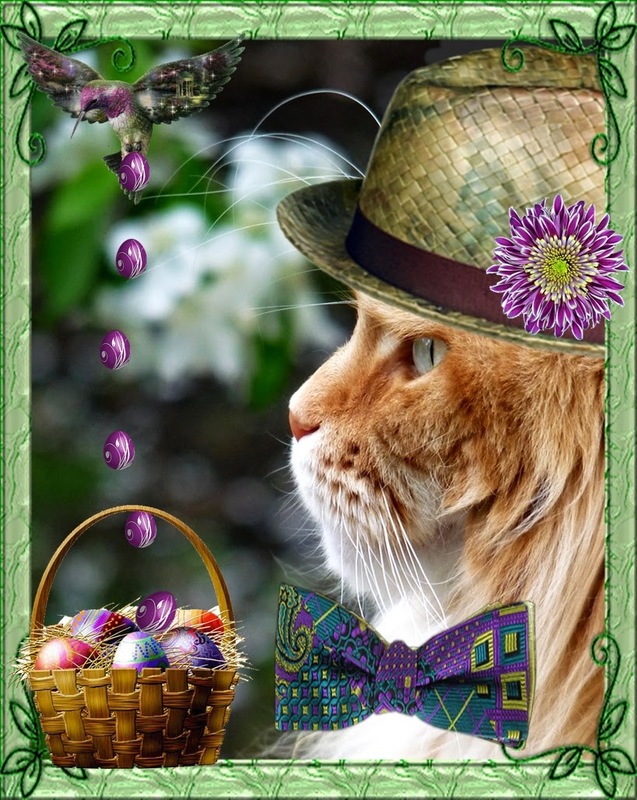 Wendy's 3-D Cats: 3-D EASTER HAT PURRADE! 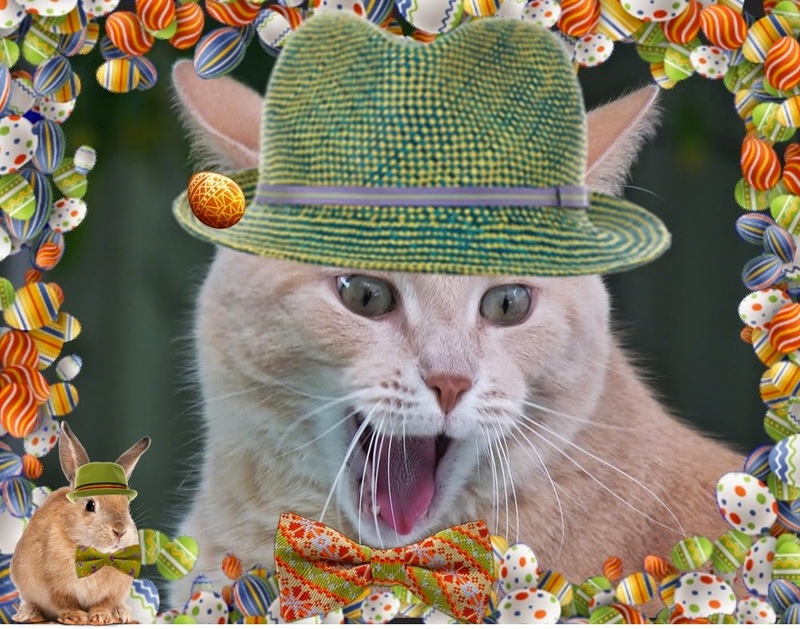 The 3-Ds just love getting hatted up for Easter. These are all new just for this year. You may want to 'biggify' the pictures to see all of the details up-close in each one. Dante starts off the PURRade in his tan woven hat with orange and burgundy band. His bunny BFF is wearing a coordinating hat reminiscent of the 1920s. As you can see, everything is just 'ducky' with them and their tiny yellow friend who has managed to 'worm' his way into their hearts. Dylan is excited about all the Easter eggs that he's found in the backyard. Since he's not an egg fan, himself, he's going to set up an egg stand and make a killing from all those late shopPURRs who need a last-minute gift. Good thing Dylan's bunny BFF is also his accountant! Domino is fascinating in her green and fuschia fascinator which she selected so she can blend right into the garden. She likes to be at one with her surroundings and gets so thrilled by the beauty of it all, that her own rabbit heartbeat thumps in time with her best Bunny Buddies. Well at least they're readily available if she ever needs a 'jump' start! Dante's looking fine in his straw trilby hat and purple, teal and lime green bowtie. He heard through the grapevine that the hummingbirds were making special deliveries this Easter. All Dante can say is "Bombs Away Boys!". He hopes there's plenty of milk inside those milk chocolate eggs. Easter is all it's quacked up to be, as far as Dylan is concerned. 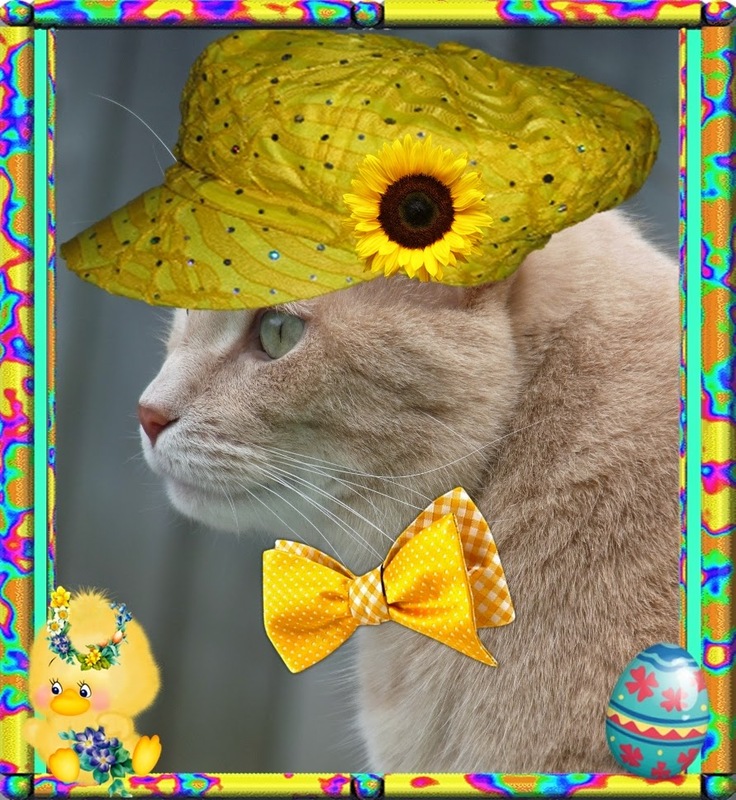 He's feline mighty mellow in his yellow newsboy cap with sequins, and his bright yellow polka-dot and gingham bowtie. He and his yellow ducky harken back to the 1960s when Peace and Love were number one on every flower child's agenda. 'Let the Sunshine' indeed! Domino's simply gorgeous in her wide brimmed see-through ivory hat with flowery adornment. She PURRoduces her very own Easter eggs with a wave of her Easter Bunny wand. "Beats huntin' fur da darn fings", says she. "Yoo cud wandah around all day and not find any at all!" Domino prefers the sure thing. The wand even comes with the Easter Bunny's PURRSonal guarantee. You never have to wonder -- or wander, again! Dante's a real chick magnet in his wide-brimmed straw hat with cornflower-blue band. He's wearing a coordinating bowtie dotted with tiny white flowers. Dante's egging on all of those chicks by placing some strategically all over the front yard. He wants to fatten them up for next Easter. "I likes dem plump an' joosy! ", says he. 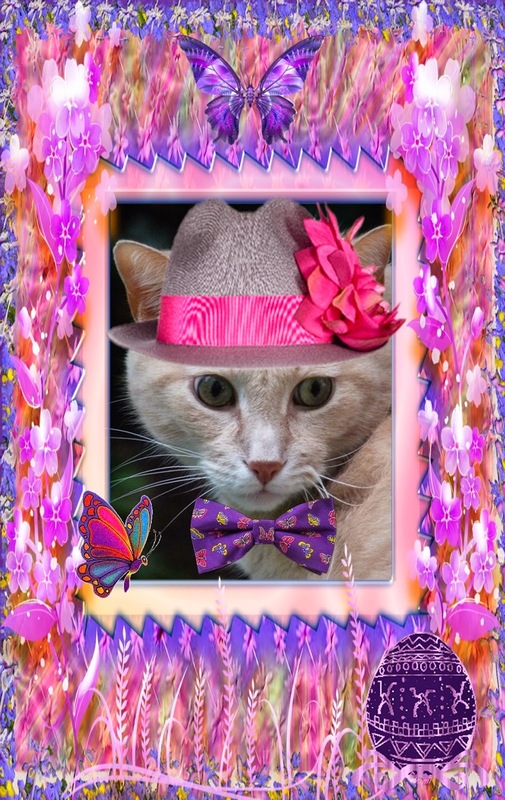 Dylan is very avant garde in his mauve fedora with fuschia band and floral feature. And he's really working the purple bowtie covered in Easter-coloured butterflies. "At leest dey're not in my stomack", he says "da buttahflies, dat is. Dey're awfully hawd ta digest yoo know." That's one thing that won't be on the Easter menu -- thank heaven! 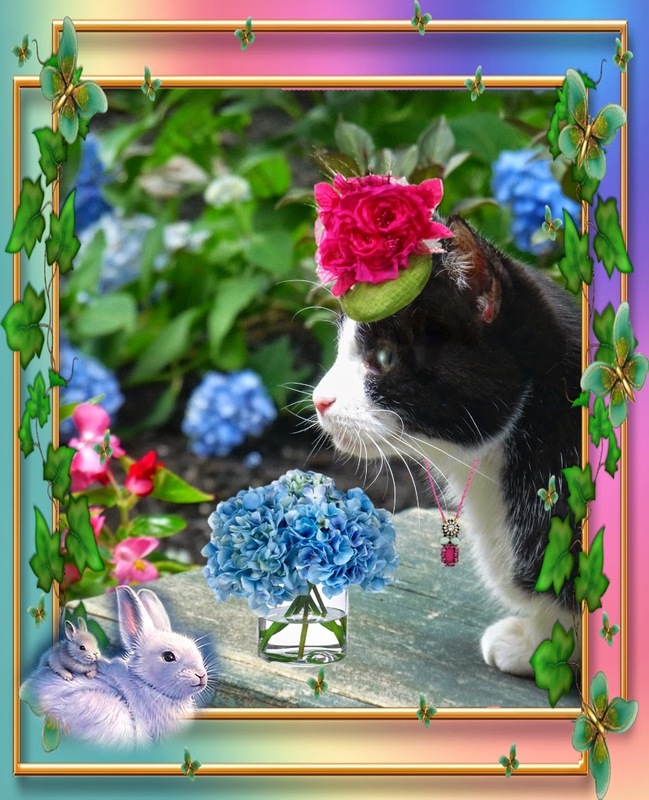 And at the very end of the PURRade is lovely Domino again in a fresh floral number with coordinating wide-brimmed hat accessorized by a large teal flower. 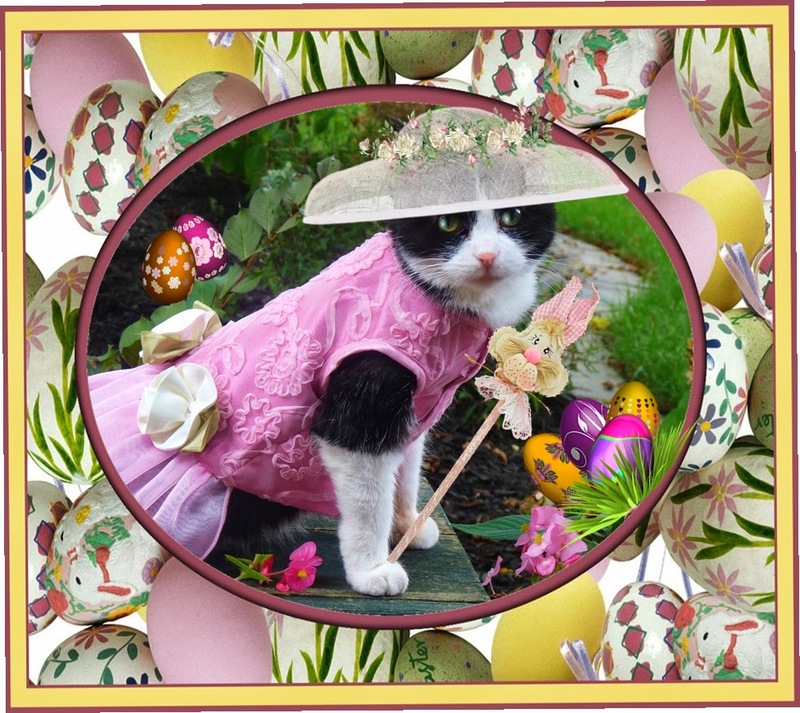 Usually her natural tuxedo coat doesn't require enhancement, but Easter is a very special occasion. She has even enlisted a tuxedo rabbit to aid in the celebration. This little bunny is wearing a pure-white cap with bow and bunny ears of its own (as if she needed another pair!). "I got no fears wif dubble da ears", says the little one. 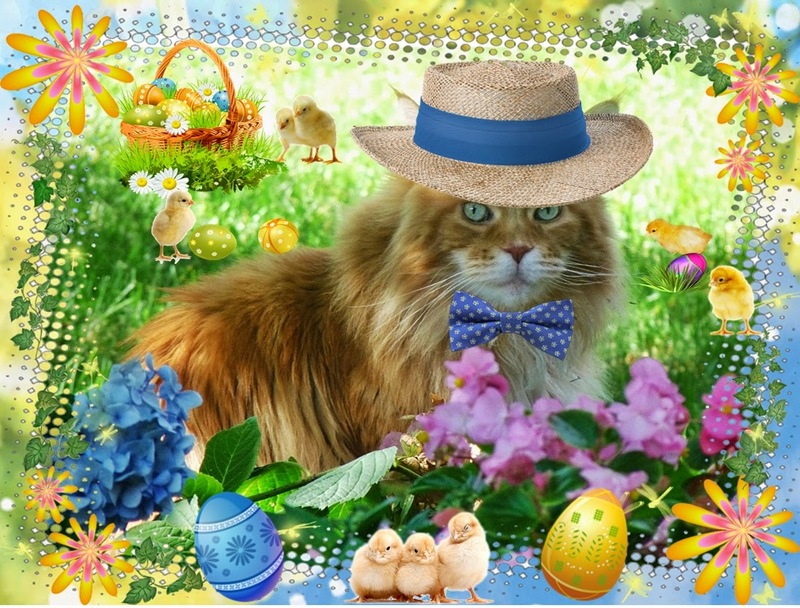 So we hope you enjoyed the Easter PURRade of Hats. 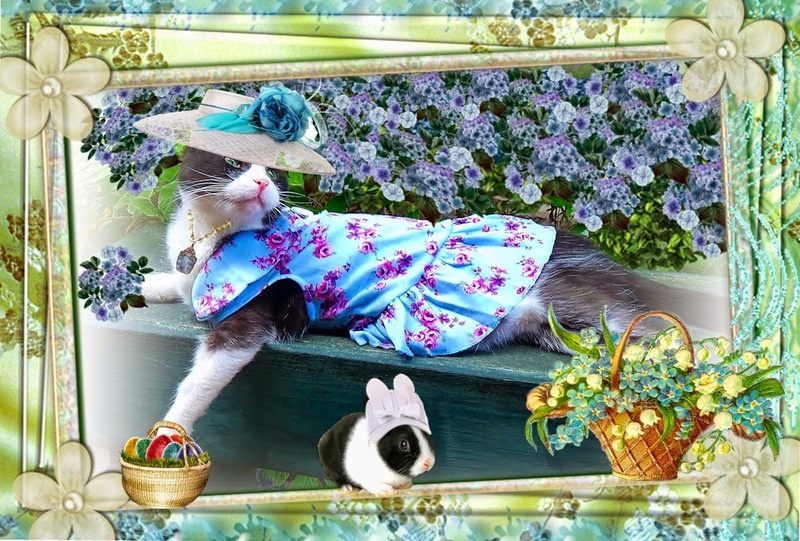 The 3-Ds and friends sure had fun picking out their new Easter finery and PURRading it around town for everyone to see. 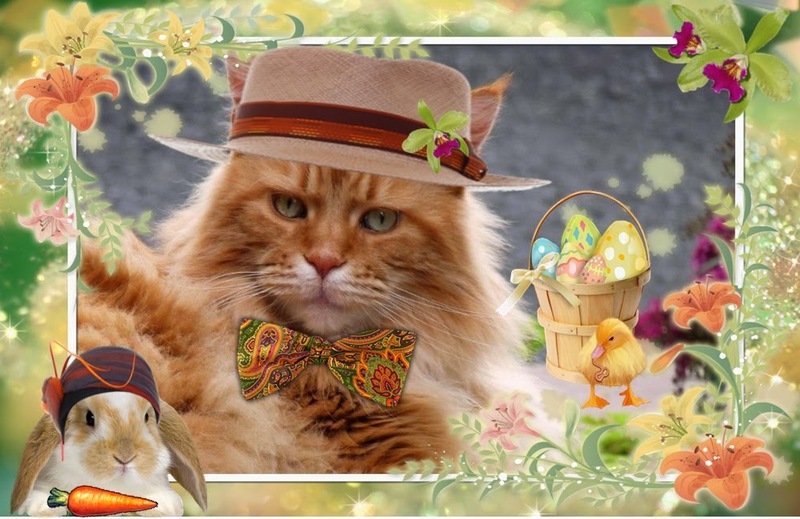 And now hat's off to a Happy Easter for all!